Grand Central Publishing, 9781455529391, 512pp. If a machine could predict how you would die, would you want to know? 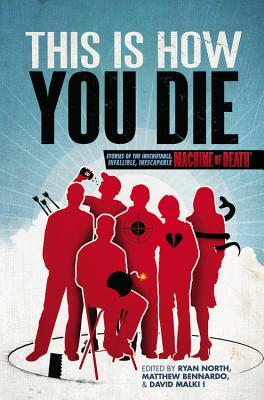 This is the tantalizing premise of This Is How You Die, the brilliant follow-up anthology to the self-published bestseller, Machine of Death. The machines started popping up around the world. The offer was tempting: with a simple blood test, anyone could know how they would die. But the machines didn't give dates or specific circumstances-just a single word or phrase. DROWNED, CANCER, OLD AGE, CHOKED ON A HANDFUL OF POPCORN. And though the predictions were always accurate, they were also often frustratingly vague. OLD AGE, it turned out, could mean either dying of natural causes, or being shot by an elderly, bedridden man in a botched home invasion. The machines held onto that old-world sense of irony in death: you can know how it's going to happen, but you'll still be surprised when it does. This addictive anthology--sinister, witty, existential, and fascinating--collects the best of the thousands of story submissions the editors received in the wake of the success of the first volume, and exceeds the first in every way. Matthew Bennardo is a writer and editor from Cleveland. His short fiction has been appearing in print and online for over a decade, with pieces in Asimov's, Strange Horizons, Daily Science Fiction, Shimmer, among others. David Malki ! is the Los Angeles-based author of Wondermark, a comic strip available online and in collections from Dark Horse Books, one of which was nominated in 2009 for the Eisner Award (the highest honor in comics) for "Best Humor Publication." He also holds the distinction of having written the longest article ever published by Poets & Writers Magazine. Ryan North is the Toronto-based author of the online Dinosaur Comics, one of the internet's most popular comic strips. He's also currently the writer of the Adventure Time comic book from BOOM! Studios, based on the television show. "Machine of Death is a marvelous collection, riddled with intelligence, creative reach, and a frankness that makes the best use of the central gimmick." "Recalls the best writings of Harlan Ellison and Charles Beaumont.... Machine of Death brought me laughs, terror and tears....Highly recommended."